A pleasant walk of about three hours following the Kholongchu river from Chorten Kora, Bomdeling is an annual migration place for black necked cranes, which fly over from nearby Tibet to pass the winter months in a warmer climate. On the way one can also visit the farm houses and their make shift cottage industry where they churn out bowls, cups and plates of wood. An hour’s walk through the paddy fields and a gradual climb over the woodlands will take you to the sacred temple of Rigsum Goemba. This temple was founded in the 18th century by Lam Tshering Gyatso, the disciple of Sakya Rinchen, the 9th Chief Abbot of Bhutan. Unlike other structures in eastern Bhutan, the wall is built with pounded mud, a style used in western Bhutan. 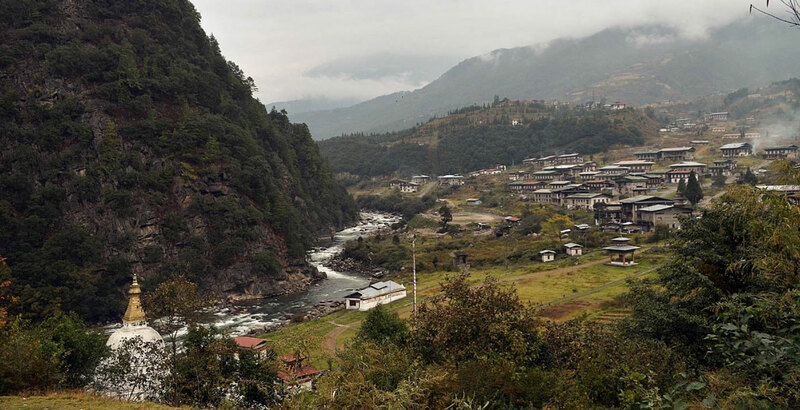 In Tshenkharla, just above the school, is situated one of the oldest Dzongs to have been built in Bhutan. Widely known as Tshenkharla Dzong, the ruins are still standing and surrounding it, one can come across the remnants of the settlement such as large stones used for pounding grains. It was built by Lhasey Tsangma, a Tibetan Prince who sought refuge in Tshenkharla in the 8th century AD. He is regarded as the founder of many important clan systems in Bhutan that dominated the political scene till the mid 17th century. A visit to the ruins will give you a glimpse of ancient Bhutan besides a scenic view of the Dangmechu river and Tawang in Arunachal Pradesh in India.